• Supreme Phantom (U spirits) — Grants other spirits+1/+1. 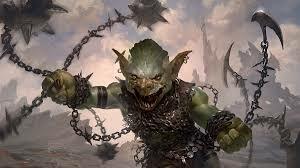 • Goblin Trashmaster (R goblins) — Grants goblins +1/+1, activate ability to destroy an artifact when you sacifice a goblin. • Elvish Clancaller (G elves) — Grants other Eleves +1/+1, activated ability (4GG, Tap) to tutor another copy of itself onto the battlefield. 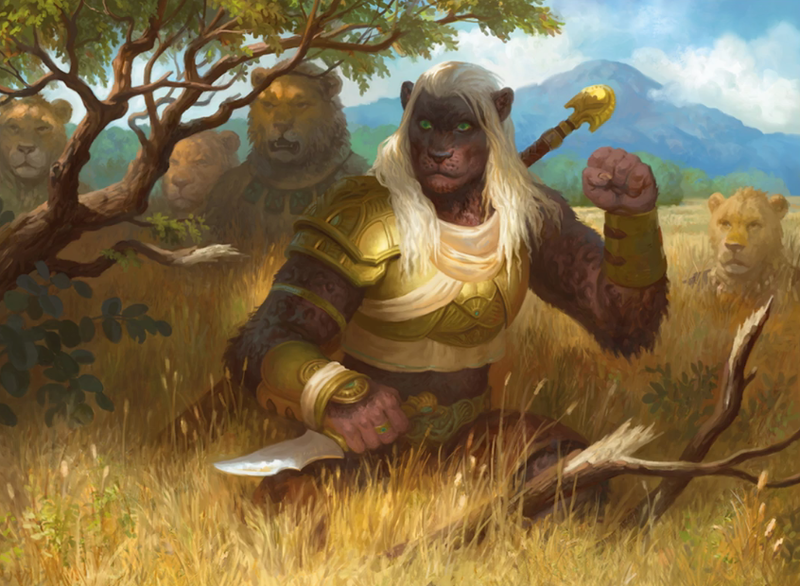 When Core 2019 releases on July 13, 2018, and before the large Fall set on October 5, 2018, there is a metric ton of cards in Standard format, but are we able to double down on the above Tribal Lords ? Ixalan / Rivals of Ixalan was a block that did have a tribal theme, but restricted to Pirates, Dinosaurs, Merfolk and Vampires. 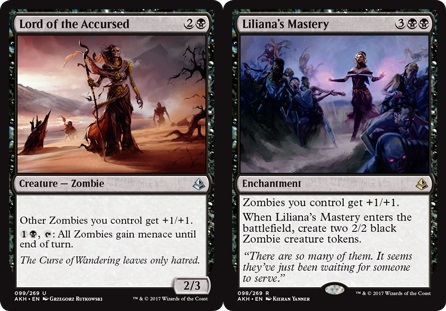 • Liliana's Mastery (Amonkhet) - Zombies you control get +1/+1. There is also a handful of other useful cards to support this theme as well which we will not go into, but do want to make a point that Embalm and Eternalize are two existing mechanics which also may be of use here. ~“Would you rather feel the edge of my blade or the sharpness of my fangs?" 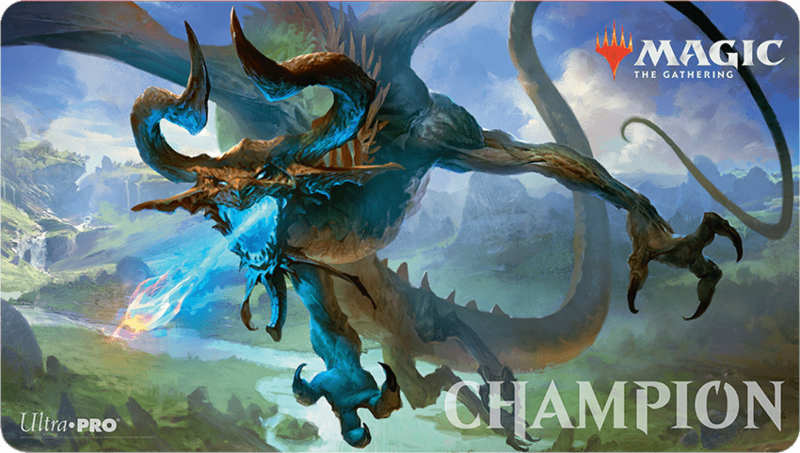 Incoming event this weekend at a gaming store near you, is the Dominaria Store Championship. With Dominaria having been officially released on April 27, 2018, Magic: the Gathering players should now have been afforded ample opportunity to hone their standard format deckles. This weekend, your time and effort; blood and tears; and countless hours of research will pay off as you are crowned Store Championship. To the victor - priceless treasures in the form of a Champion playmat and deck boxes from Ultra PRO, and promo cards. Should you find yourself North of Toronto, do drop in to OMG Games, in Barrie, Ontario on Saturday 23 June at half-past noon. As of this afternoon, Magic: the Gathering gamers have been delivered about 215 (of 280) official Core Set 2019 card previews by Wizards of the Coast and their media friends. 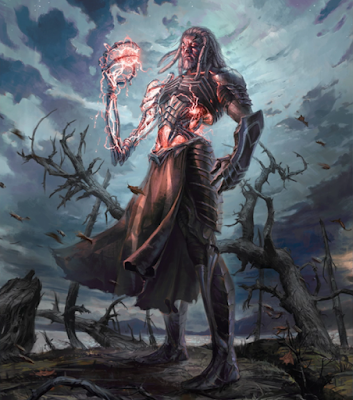 The Core Set, releasing on July 13th, returns to MTG after a short ( THREE YEAR ! ) 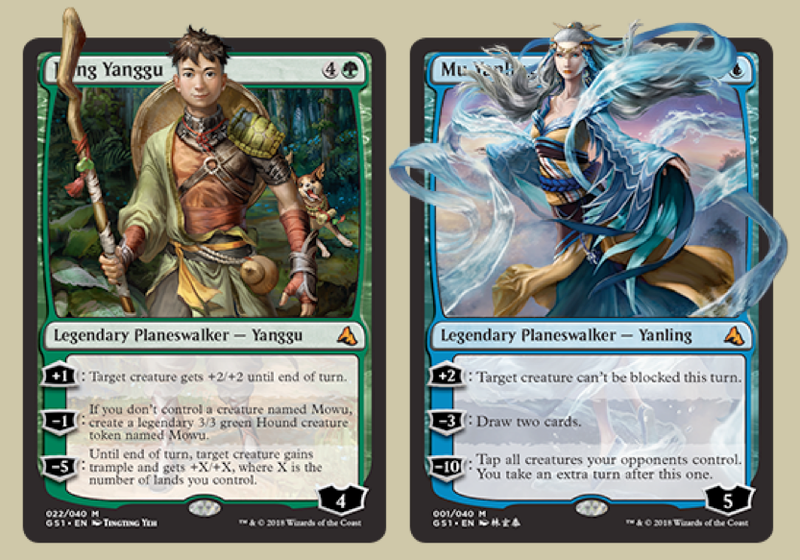 hiatus after this was dropped after Magic Origins in 2015. To date, we have been treated to 2 installments of a storyline created by author Kate Elliot which has been a very good read. 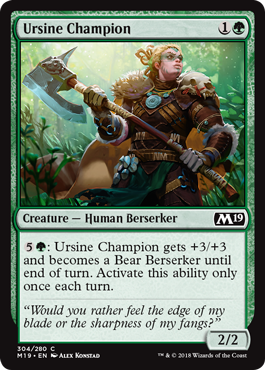 We could talk about some of the very cool and slick new cardboard which has been previewed so far, and perhaps how this new set may impact the meta game in each format, but we really do want to talk about the big BEAR in the room - Ursine Champion. This sweet card is most definitely a 'bear' - 1X for a 2/2, quite conventionally in green or perhaps white. Although the creature type is a 'Human BEARserker', she does have an activated ability to actually turn into a freak'n bear ! These WereBear creature shenanigans may be more at home on the Plane of Innistrad, but we are loving it. Late game, with a pinch of mana acceleration, this 2/2 grows to a sizeable 5/5. 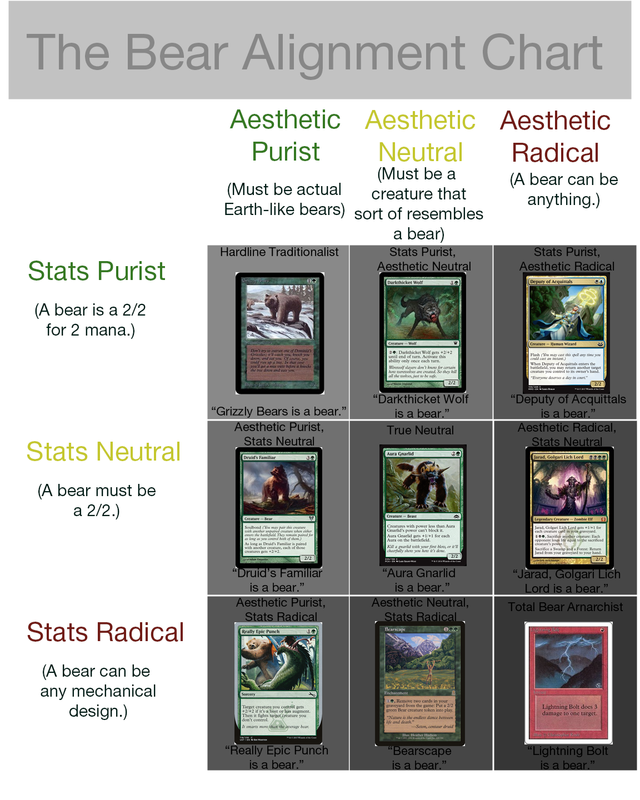 This is no common 'Vanilla Bear', and most certainly in the territory of 'Value Bear', but will the discerning MTG fan dare even say bear at all ? 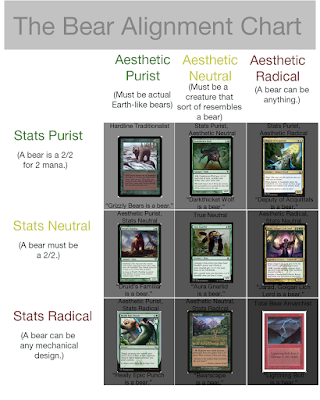 Here is a very handy Bear Alignment Chart, created by redditor IanUlman for reference should you wish to provide a shot to categorize further . . .
On Friday, Wizards of the Coast had another treat for Magic: the Gathering players. Specifically the Weekly MTG panel on Twitch with Blake Rasmussen (Content Manager), Paul Cheon (Game Designer), Bill Rose (VP R&D), and Charlie Cateeno (Director R&D) sat down to discuss a variety of relevant and interesting items. Yesterday, regular Magic: the Gathering story instalments restarted on the Wizards of the Coast website, with the first of eight short stories to be shared for the Core Set 2019 story arc. 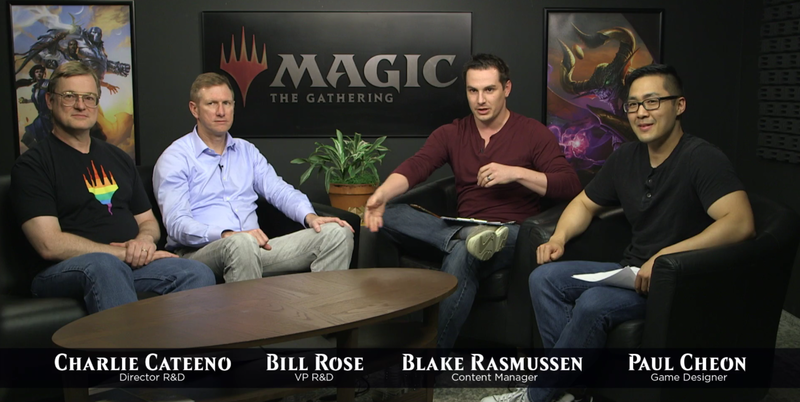 Previously, Wizards had been producing stories ‘in-house’ with the R&D Narrative Team, and on the whole, these were very good. With Return to Dominaria, author Martha Wells was engaged to produce a whopping 12 short stories. Considering what a herculean effort it was to pen this, it really did make sense for Wizards to work with a professional author, and have the Narrative Team focus on creating a canvas, characters, and major plots to mesh with the cards created for each set. 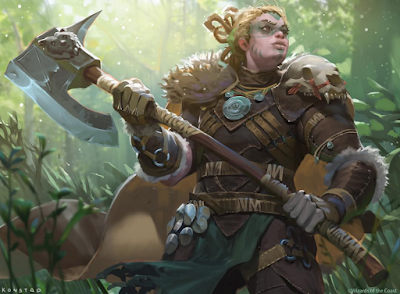 18 years after the events of Fate Reforged, Yasova (formerly Yasova Dragonclaw) leads her granddaughters and a hunting party into the wilderness. 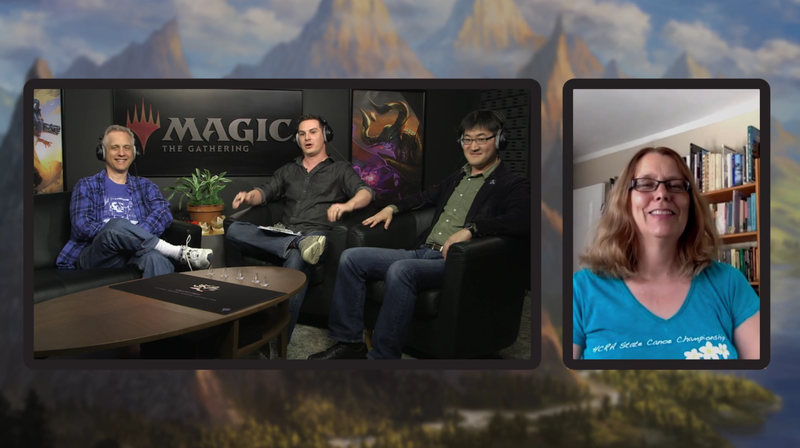 There her granddaughter is visited by mysterious vision, telling her the story of the birth of none other than Ugin the Spirit Dragon and of Nicol Bolas himself. 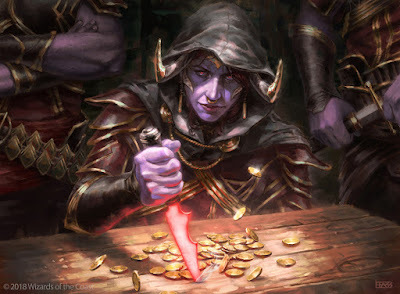 Had you not read this great first installment, we suggest you do, before we move along, as we are hitting / highlighting some rather interesting details presented as they unfold on Tarkir. Yasova (previously Yasova Dragonclaw), is a grandmother. Her granddaughters, twins Naiva (more a hunter) and Baishya (more a shaman) have been given a message from the Windfolk (some sort of Elemental beings) who communicate with the human ‘whisperers’ with shamanic gifts. This message seems to be from the Spirit-Dragon, Ugin. The stage now appears to be set upon a path to find the (corpse or spirit) of Ugin. Other items of interest folded into the story concern Dragons. We appreciate the literary device (?) 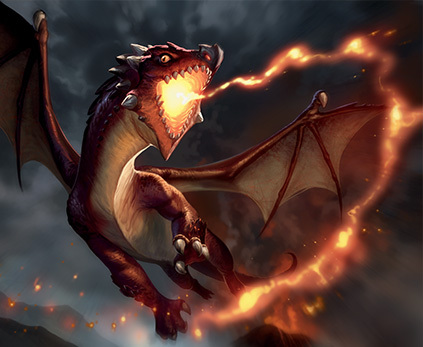 used to capitalise letters indicating the story section about dragons, and dragon-speech. We are shown what appears to the Ur-Dragon, the primordial essence of all Dragonkind, with its avatar speeding across the skies of an un-named plane of existence, essentially dropping dragon eggs. 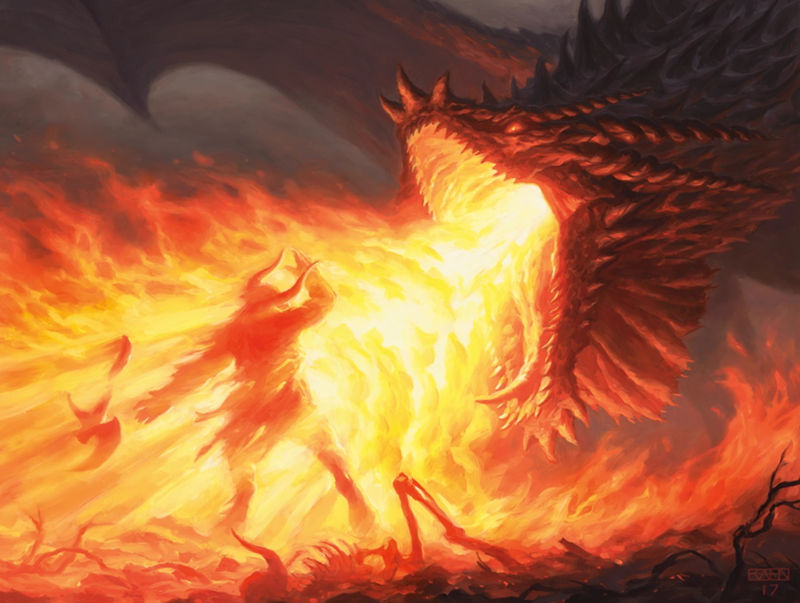 The first wave of eggs include Palladium, Chromium, Arcades, Ugin, Nicol, and Merrivia Sal, but two other dragons are stillborn and fall to the ground. The dragons are born sentient / intelligent and knowing such things as their names. The big bombshell here (for us at least) is that, not only is Ugin an Elder Dragon, but he's also Nicol Bolas' brother. These newborn twins witness the death of a ‘sibling’ dragon Merrivia Sal, whose scales had yet to harden, who was killed by a pack of human hunters. We learn quite a bit from this event which assists us in understanding the character of each of these two creatures. 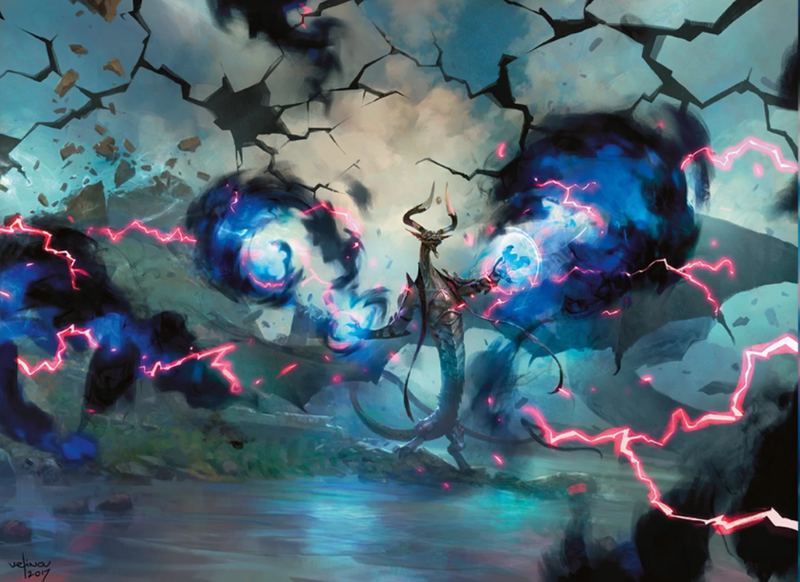 Where Nicol Bolas is full of fury, wanting to avenge the death of Merrivia by destroying all the hunters, Ugin appears more practical in calculating potential risk (the ‘long game’). Looking very much forward to Kate Elliott’s next stories. For now, you should know that the Core Set 2019 card image gallery is now up to be populated with new previews as they happen. 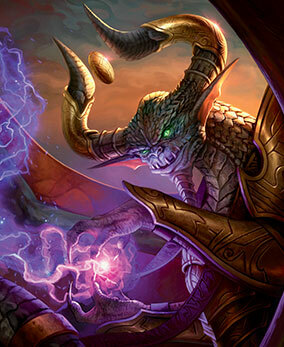 For this post, we are just touching upon the promotional cards associated with the upcoming Core Set. According to The Mary Sue, Vivien was born on Skalla, and is part of a tribe of rangers and druids known as the Smaragdi, who protect the wilds of that plane from the growing destructive civilization. 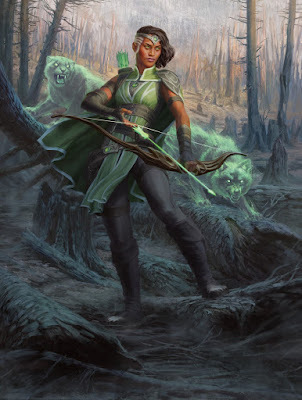 Vivien has a special bond with the animals of the forest, which manifests in her Arkbow. It is not every day (set) in which Magic: the Gathering players are presented with a new creature type by Wizards of the Coast. With the release of the newest stand-alone set, Battlebond, there are now just under 240 creatures in total, which includes Changelings and Mistform Ultimus, which are every creature type. So what new creature has been created with the introduction of the new Multiverse Plane of Existence called Kylem ? Let us meet the 'Azra'. If you are familiar with the other popular Wizards of the Coast brand, Dungeons & Dragons, then you might be familiar with a creature race known as the Tiefling. These humanoid creatures resulting from a human and demon bloodline. There is an excellent video on the Forgotten Realms Wiki linked right here. Unlike the Tiefling, the Azra have no tails. The Azra are native on Kylem and do have a distant demonic ancestry. 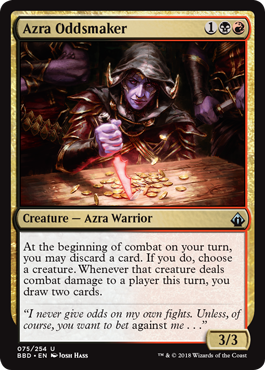 In Magic: the Gathering, the Azra are found in the mana colours of Black and Red. Theses creatures have one or more sets of differing shaped horns on their heads and unlike humans, their skin may be blue, purple or other darker colours. The males of the species may also have horn like appendages on their chins. Wealth, taste, and trickery are the azra's primary interests. They flock to Valor's Reach for the competition on the field and off—lightening the purses of other attendees is just as exciting as watching a match. The azra love anything gold and shiny and aren't afraid to show off their wealth. Thus, most azra become merchants, though others seeking quick coin might turn to a life of crime as rogues, assassins, or mercenaries. 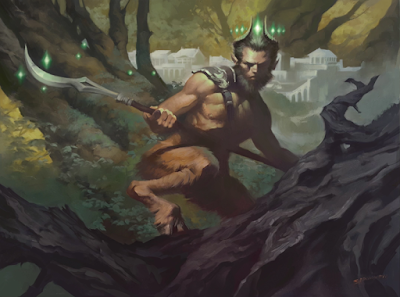 Battlebond is the first-ever Two-Headed Giant-focused Magic booster set. It will be released on June 8, 2018. 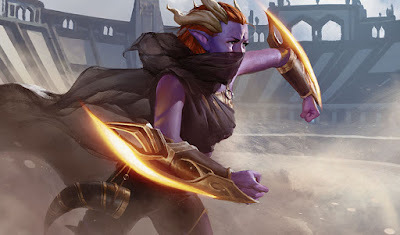 Battlebond is the Innovation Product for 2018, and is designed to be drafted. As we have said in previous posts, Magic: the Gathering standard format is not only a healthy format, but interesting as well. From this weekend's results of Pro Tour Dominaria Richmond, the top decks were heavily weighted toward aggressive red and red / black decklists, but the metagame can easily evolve to respond. Let's yatter about that for a moment. 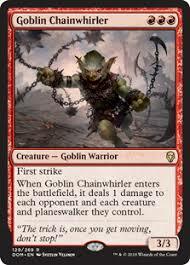 Of the Top 8 decks, seven decklists had a full deck-set of four copies of Goblin Chainwhirler. Given this, the very first thing a player may note is that token strategies (generating tokens 1/1 or less), may not be effective at all. Following this, if one were to look at the full decklists (linked over here), one may note that burn is generally quite the major theme here. The natural refuge against burn / red aggro archetype is life-gain. 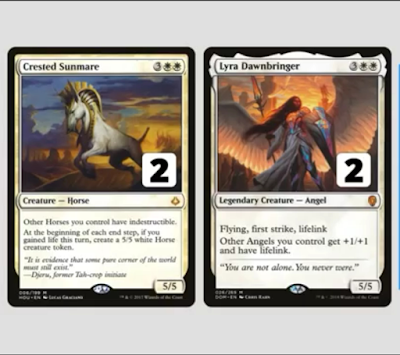 To this end, we would suggest going back to the large number of such decklists which were posted by players shortly after when Crested Sunmare was previewed and folks were attempting to make this solid card work. The metagame at the time, did not allow this sort of list to be all that efficient, but perhaps it is time to revisit. 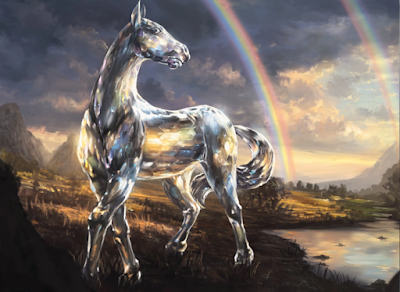 Do check out the latest video over at MTGO Traders linked right here, along with the decklist posted here. If you were contemplating a right time to game with such a decklist, the time may be now. 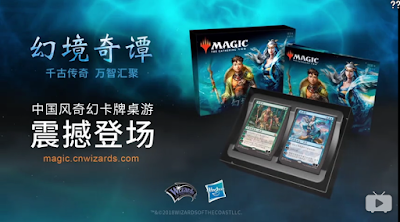 We do have some Magic: the Gathering news to report to you on the new Wizards of the Coast product ‘Global Series: Jiang Yanggu vs. Mu Yanling’. 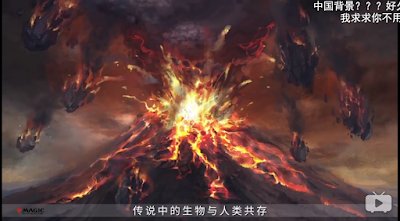 Specifically, we do now have a proper Video Trailer posted over at the Chinese website bilibili.com as well as a product page update over on the mothersite. He doesn't know his name and family. He named himself Yanggu (literally "vale of sunrise") after the east most vale. To save the Jiuli Clan which is haunted by plague, Yanggu ventured in to the Mountain of Ten Witches for a solution, but find himself acquainted with a mystery lady through battle. With her help, Yanggu tackled the threat of plague. In order to find out who he really is, he went onto the journey of expedition with the lady. In the thundering roar of Kui cattle, violent wave devoured Mu Yanling's homeland. 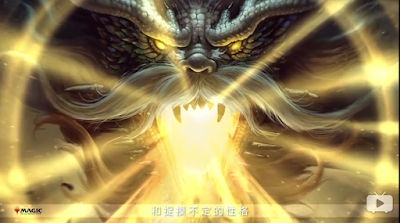 Luckily, she was saved by Lishan the wanderer. But when the two went on the journey to Yunmeng the Great Lake, Lishan suddenly met a bizarre death. Holding Lishan's body, poor desperate Yanling cried and lost consciousness, but when she wake up, Lishan's body is nowhere to be found. Despite the sorrow and shock, it gave Yanling a glimmer of hope - could Lishan be alive? This product is really great in its goal to untap a potentially massive yet unexplored and undeveloped market. We certainly applaud the effort but we think that (from our Canadian viewpoint), the Americans, no matter how deeply they engage their Chinese consultants, this product is not going to be a success. We think that Wizards will realise that the disappointing response to this product is mostly due to not engaging and tapping into the existing Magic: the Gathering fan base, who do not want anything like this at all, but actually something not at all far removed from the existing products already available.